CRYPTO Markets Sideways Continuing IndecisionsteemCreated with Sketch. Crypto markets are still sideways. Bitcoin is technically up on the day so far, and interestingly enough, the other markets aren't really following too much. Since the markets have been slow lately, I figured this would be a good time to take a look at the weekly chart. 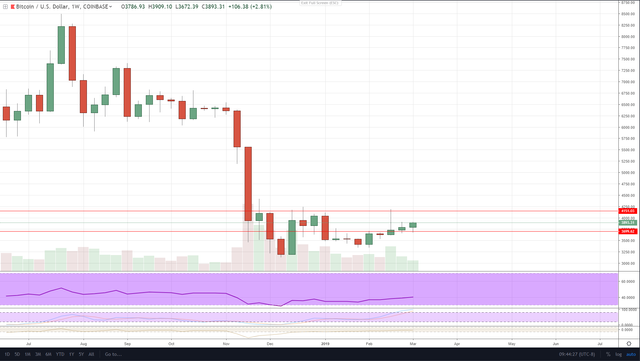 We hit a bottom and also the oversold weekly RSI, at which point we saw the bulls step in and rally prices. Now we're seeing the RSI come back up, and also the stochastic RSI hit the upper levels. The daily RSI levels have been overbought, so is this a sign? I'm not sure. Realistically I think we will actually continue to see some tightening ranges on these crypto spaces. The last big crypto bear market was reversed only when prices stabilized for a while. I'm thinking that will be the case this time as well. It will take a lot of price stabilization to remove the bear fear. Once this happens, we will start seeing bullish news and then prices can continue another rally. Hope you're all having a great week! Happy Friday.